The San Jose Sharks are 11-2-3 in their past 16 games and are in prime position for a playoff berth, sitting second in the Pacific Division with a healthy seven-point lead on fourth-place Arizona. 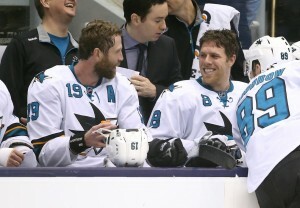 Most national media though are quick to overlook or write off the Sharks based on their past playoff failures. Despite the fact San Jose has significantly improved their depth this season, Joe Thornton and Patrick Marleau are still the most frequent names brought up in casual Sharks commentary. However, unlike the majority of their past playoff failures, this year’s Sharks haven’t been overly reliant on their top players. (For context purposes, Logan Couture, Joe Pavelski, Marc-Edouard Vlasic and Brent Burns are also considered top players.) San Jose has just as many depth players contributing quality minutes as star players. Guys like Tomas Hertl, Joel Ward, Paul Martin, Justin Braun, Joonas Donskoi, Brenden Dillon and starting goaltender Martin Jones are all enjoying solid, if not terrific seasons. While the other six lineup regulars aren’t necessarily having good years, in recent weeks, they have all found ways to contribute. Matt Nieto and Tommy Wingels have disappointed overall, but have cemented roles on the second and third lines as the Sharks have essentially rolled out the same top three forward lines every game of this 16-game stretch. Over the past seven games, the Sharks fourth line has remained intact as well, with veteran Dainius Zubrus and youngsters Chris Tierney and Melker Karlsson playing terrific hockey. Rookie defenseman Dylan Demelo has also been gaining more and more confidence in a regular top-six defense role over the past few weeks. There is a lot to like about the Sharks if you look past the superficial headlines. The Sharks current hot streak started immediately after head coach Peter DeBoer decided to split up Patrick Marleau and Logan Couture onto separate lines. This has created matchup problems for opponents on a nightly basis. With Joe Thornton centering the top line, Marleau the second, and Couture the third, one of the three is going to be out on the ice against third-pair defensemen from time to time. Thus far, the Marleau line has been the least effective of the top three lines in terms of offensive production, but they have rarely been pinned in the defensive zone. Marleau has been on a line with Ward most of the season. Their season plus/minus numbers don’t look great at minus-11 and minus-17, but for most of the past 16 games they have been hovering around an even rating. The Thornton and Couture lines have been thriving offensively and given Marleau and Ward’s playoff performances in years past, that is a pretty darn good combination to have as a third most effective scoring line. Even though they haven’t been of late, they are a threat to break out for a big game at any moment. As mentioned above, the fourth line is playing excellent hockey and it is no surprise why. All three players have played effective NHL hockey on higher lines in the past. Even Zubrus, who signed mid-season after a pro-tryout, had an effective four or five game stretch on the top line with Thornton. Last season Tierney managed to score 14 points in his final 18 games as a rookie while centering the third line. Karlsson also impressed as a rookie in 2014-15, playing mostly on the top line with Thornton. The days of fourth line only players who are known primarily for toughness and fighting are on the verge of extinction. We all saw last season how the tremendous chemistry of Chicago’s fourth line of Andrew Dejsardins, Marcus Kruger and Andrew Shaw was a huge difference maker in the Blackhawks’ third Stanley Cup in in six seasons. All three of these guys can make plays and are responsible defensively. The Sharks’ current fourth line group of Zubrus, Tierney and Karlsson is proving to be the same type of trio. In San Jose’s 4-1 win over the Coyotes on Saturday, Zubrus, Tierney and Karlsson were not only a plus-2 (on the ice for the first two Sharks goals) but they drew a late power play and spent the majority of their shifts in the offensive zone. Everyone who has followed me the past two seasons here at THW knows that I’m adamant about Burns being better utilized at the forward position. However, the Sharks’ current hot streak has not surprisingly coincided with a vast improvement in Burns’ defensive game. On the season Burns owns a minus-11 rating, but over the past 17 games he’s a plus-4. The defensive turnaround at even strength hasn’t come at an expense of the offensive game either has he still has 14 points over that span. With Burns and defense partner Paul Martin now trending the right way, the Sharks have as strong of a top-four defense as any in the league. Vlasic and Braun are a top-flight shut-down pair, while Martin is an excellent shut-down defender in his own right and Burns is an athletic freak of nature. Burns will always be the type of defenseman that can get a wild hair up his nose at any given moment, but he has tamed his offensive instincts enough to become much better at even strength over the past few weeks. First year starting netminder Martin Jones has had his ups and downs as he adjusts to playing far more games than he did as Jonathan Quick’s backup the past two seasons. Jones’ hot streaks though have been far more dominant than those of San Jose’s previous starting goaltender, Antti Niemi. Jones currently sports a decent, albeit not great save percentage of .916. However, his ability to steal games is the big difference maker. The confidence the team has in front of him is easy to see. For most of Niemi’s five-year stint with the Sharks, there wasn’t that same feeling that he would come to the rescue. 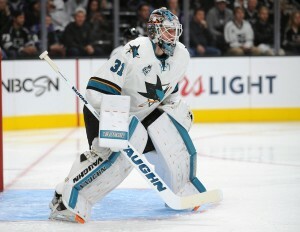 Time and time again though Jones has kept the Sharks in games with highlight reel saves in short succession. There is little doubt that the six best teams in the Western Conference are the Blackhawks, Stars, Blues, Kings, Ducks and Sharks. San Jose has beaten all five of their fellow Western powers this season and have played multiple quality games against four of the five. Thus far, they have only played the Blues once this season and beat them 3-1 in St. Louis. Overall against these five juggernaut opponents, the Sharks’ record is a solid 6-6-2 and they have arguably played better than that record suggests. The Sharks held third period leads in both overtime losses and two regulation losses against the Ducks were games you could argue the Sharks deserved a better fate. The point to be had is that San Jose is plenty capable of beating any of the other top contenders in a seven game series. There is simply no team in the league that the Sharks can’t play with. They may not be favorites to win a series against some of these teams, but there is no series where they should be considered major underdogs. While the Sharks could benefit from acquiring a veteran sixth or seventh defenseman by the trade deadline, their overall defensive depth is actually much better than two years ago. 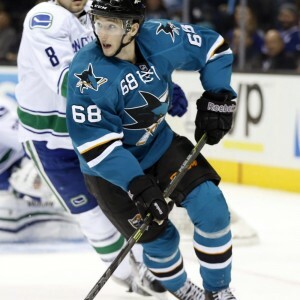 During the collapse against the Kings in the 2014 playoffs, the Sharks were left without a left-handed defenseman remotely capable of filling the shoes of the injured Marc-Edouard Vlasic. This year is far different. 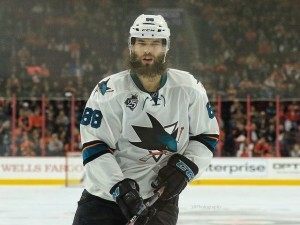 With Martin brought in as a free agent, the Sharks would have a much better chance at withstanding the loss of their best defenseman. Martin could slide up to play with Braun as a shut-down pair and Dillon could move up with Burns. Or they could leave Martin and Burns together and play Dillon with Braun. Neither is certainly ideal, but far better than what the Sharks were left with two years ago which was the shells of Brad Stuart and Scott Hannan and the inconsistent Matt Irwin. While some pundits will point out the Sharks’ 1-6-1 record this season without one of their top-four defenseman, most of those games came early in the season before the Sharks started rolling four forward lines. Not to mention, that was also before the increased defensive performance from Burns. Furthermore, Dillon’s confidence is at a much higher level after his strong season leading the third pair and he’s expected to return to the lineup shortly from a minor injury. The defensive depth could benefit from a veteran sixth or seventh defenseman, but they don’t realistically need another No. 4 or No.5 as some might have you believe. To put it simply, the Sharks are currently getting quality contributions from all four forward lines, all three defense pairs and their starting goaltender has proven the ability to steal games. With an elite power play (third overall) and solid penalty kill (19th overall), this team is firing on all cylinders. One could make the case this is the deepest lineup in franchise history.